SAT, 12 December 9.00 p.m.
SUN, 13 December 8.00 p.m.
"STYX" (in ancient mythology, a river at the boundary of the underworld) indicates a point of view, a limit of thinking and feeling, from which the most iridescent sound patterns, ridiculing any theory of music, can be conceived in their essential features, and thus become accessible for a musical composition. In my preceding larger work ATEM (BREATH) (1981/82), I took the serial composition process to extremes. 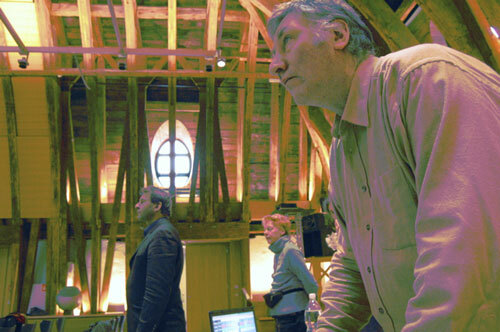 Variations of rows that are derived from the sound material itself determine all areas of the composition – particularly the so-called “technical” parameters that thereby become musically available. In this systematic work, I again and again delved into sound realms that had something special to them. 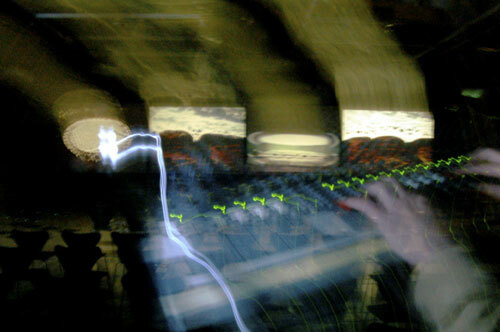 At the intersection of electronic transformation, sound types appeared that convey an authenticity that one otherwise only knows from good recordings – with the advantage that they do not have to refer to anything more than themselves (“recording of ...”). What is amazing is that these sound forms appear to be resistive against the methods that help make them detectable. They cannot be explained by serial composition. Therefore, I largely avoided them during the work on ATEM. (In my written records from that time there is the following note: “With such sounds one can absolutely not compose – or if so, then 24 hours of music – dream-ridden”). In STYX, however, I took them up again. 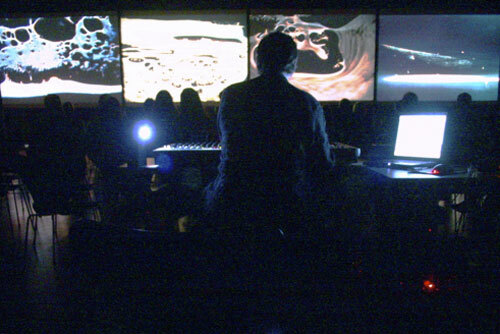 The condition was that one has to get involved with their independent existence: Composing no longer as an “ordering of tones,” but rather as a type of dramaturgy of sound forms that tells their own story. 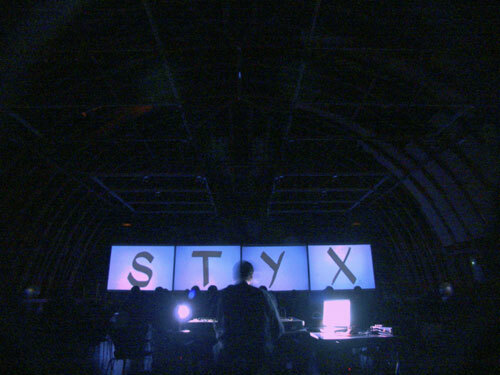 Therefore, STYX traces an arc back to my first audio tape pieces (MUGL ENTSTEIGT [MUGL ARISES]). The most important design principle was the metamorphosis or, technically stated: the electronic transformation. Although it would last years until I had a computer with audio output, it was already clear that one could expect unforeseen new processing methods. The anticipation (and the corresponding theoretical preparatory work) spurned me on to new combinations of already known processes. As a matter of fact, in this work I anticipated some of the things that were generally available much later with the emergence of faster processors – often in hour-long processes with audio tapes and simple, but high-quality electronic devices that Georg Danczul had constructed according to my ideas. A new challenge was the design of the screen change. 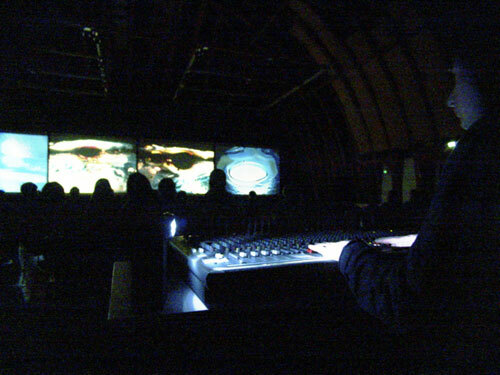 That means it was not really so new after all, as in the previous years there was a loose cooperation in the combination of improvisations, audio tape feeds and slide projection, as well as a completely composed piece “Märchen” (“Fairy Tale”), that is still audio-visually performable today. 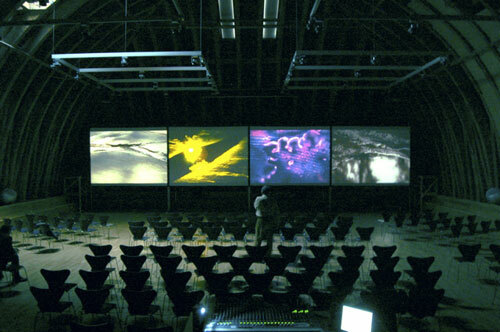 However, there were four screens for the four sound channels (that was clear from the beginning) and the contrapuntal screen change afterwards was definitely a “musical” task. While I was working on STYX, with interruptions, nonetheless, for two-and-a-half years, Renate Porstendorfer took a series of photos independent of my work. Partially in Waldviertel, partially in the Salzburg mountains, on fields, at rivers, at waterfalls; many landscape pictures, but mainly moments of moving water and light effects. In addition, there were microstructures with glass and colored etches that often had a more graphic effect than the images of real landscape elements. Moreover, there was an increasingly more sophisticated handling of various film material. Thousands of pictures. As it became increasingly clearer that these images in the form of projections can produce an optic level to STYX, fundamental decisions had to be made. One of these was: cross-fading, yes or no. Similar as in the music, I consider fade-ins, fade-outs and cross-fading to be useful technical methods for pictures, but not to be formal solutions. (Even today among us electroacoustic musicians, the “fade fader” is a “running gag” when we hear old pop music songs that have no other way out after three minutes than slowly pulling the volume modulator down). Thus: rough transitions. The rhythmization of the screen change took on a new significance. The combination of images, the lines and levels of motifs and colors was Renate’s work for the most part; the rhythmization was mostly mine. Whoever has set a series of images or film to music knows that acoustic time and optical time are not the same things. The same holds true for the contents that are to be transported. At the beginnings of the talking film, the Russian filmmakers like Vertov and Eisenstein established the dogma that sound and film may never represent the same thing. Well, I wouldn’t adopt this as a dogma, but it is true: One thereby forgoes a whole dimension – just like one forgoes a dimension when the image rhythm and the musical rhythm are flatly linked to each other. Indeed there are relationships between individual images and musical motifs, but their temporal coherence can greatly diverge – looking forward, flashing back or syncopated. A precise concurrence of the screen change and acoustic accent is reserved to very few dramatic moments. Otherwise, the various narrative strands run parallel on several levels and combine to make a single large epic bow, precisely to a fugue in sounds and images. 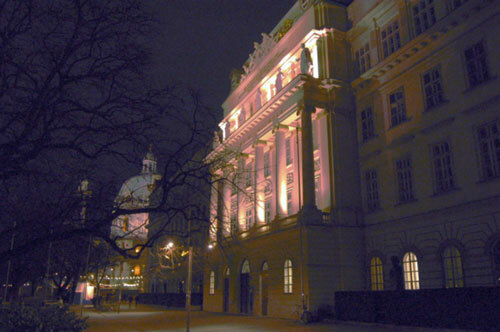 The premiere of STYX in the original version took place in December 1985 at Palais Erzherzog Karl in Vienna. Two further performances followed: one at the Konzerthaus Vienna in 1986, and one at the Munich Philharmonie in 1987. 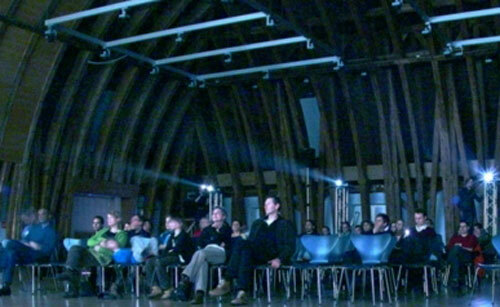 From then onwards, the piece was shown several times in Austria and Hungary in a reduced version with only one screen. 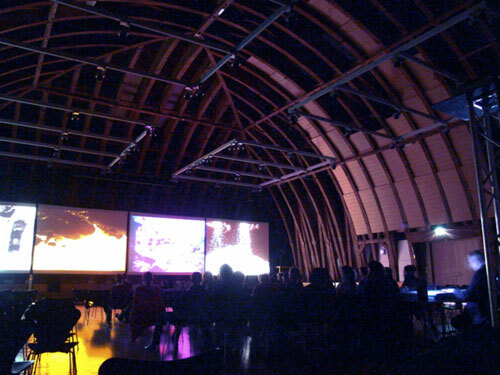 The present version is a digitally reconstructed new synchronization of the music from the intermediary material, as well as the projector control of the original slides. Even for practitioners, it is not always comprehensible what I mean by sound material. I see and use it actually as material in a manual sense. Nonetheless, I am repeatedly asked the same question; yeah, which types of recordings are being processed there. I stress once again that they have no anecdotic meaning for the dramaturgy. It is not a radio play, it is music. However, I don’t make a secret out of it. With the exception of the combine harvester recording, which lasts a good half-hour, these fragments are relatively short. However, the intermediary material, and all the electronic transformations and developments from this original material are found on more than 50 audio tapes, making up a total of approximately 30 hours of sound.